Saint or sinner? - Lovely Etc. You are here: Home / Crafting / Saint or sinner? I am totally loving all the different paper wreaths floating around. I adore books, and book page wreaths are right up my alley. I usually have one or two for sale in my booth at Olde Salem Mercantile. 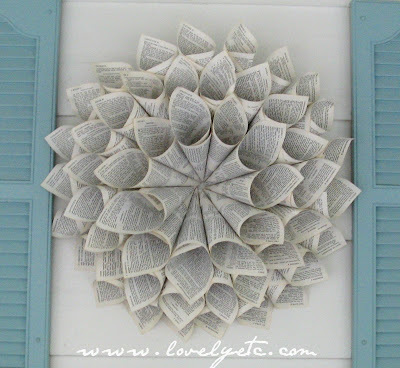 I particularly love to make wreaths from old hymnals. At first I was a bit hesitant to rip up old hymnals. But I love for the things I decorate my home with to be meaningful, not just pretty. And seeing my hymnal wreath reminds me of all the great old hymns I grew up singing. Once I began looking for old hymnals, I found they are everywhere. I find them at yard sales and thrift stores on a weekly basis – and I seem to be the only person buying them. I would rather use them to make something that is relevant for today’s families than see them sitting around on a thrift store shelf. That brings me to today’s project. At an estate sale several weeks ago, I found an old Bible that was pretty torn up. When I asked about it, the family running the sale said I could have it for free. As you can see, it is not in good shape. The cover is completely torn up and there are several whole books of the Bible missing. I am not sure how old it is because the title page was missing but I would guess early 1900s. When I saw it, I knew that it was probably never going to be used as someone’s personal Bible again. But there was no way it should be thrown away. I wanted to use it for something that would honor it more than just setting it on a shelf somewhere. I really wanted to make it into something for my home and I immediately thought of a wreath. But I was hesitant – because taking the Bible apart just seems wrong. But then again, it was already pretty ‘apart’ so I decided to go for it. I really love how it turned out. Talk about meaningful art for your home. What do you think? Does this seem like a way to save an old torn-up Bible from the trash? Or does it seem like DIY gone horribly wrong? Honest thoughts only please! Since this Bible is already falling apart, I think its a lovely way to make meaningful art. I wish I could give you some useful advise. I was raised to believe one should never destroy or disrepect a Bible. On the other hand, maybe someone who saw this would actually be inspired to READ the words they see, instead of dismissing it. When I first read your article I nearly passed out, but really, how is this any different than the millions of bumper stickers, shirts or other art that has scripture written on it? The truth is, it isn’t. The quality is lovely and the spirit of your work is honest, unlike many others who use Bibles in their so-called art. I love this wreath! Do you have a tutorial on how to make one? I especially like the shape of yours! I think you saved it from the trash! It’s beautiful! I too, love books, especially the Bible, but I don’t view this as any dishonor to the written Word , as it was so torn up it would have most likely been pitched soon. The Word of God is living & is to be hidden in our hearts. And we are to reflect that Word in our words & actions toward others. I believe it is a lovely piece – that this Word could be salvaged & now adorns your walls – well done. Blessings! It’s gorgeous I LOVE it!! I agree with many others that you saved it. It’s bring used, rather than being useless & torn apart. I don’t feel you’ve disrespected The Bible and it’s contents by making this beautiful wreath. Everyone has their own opinion, but mine is…..it looks fab! I love it! Hope you share this at my link party tonight. I really wanted to give you a good honest answer, I had no idea what to say! My first thought is its gorgeous! WOW I love it, I think that I have to make another! (you have to come and see mine! Its a couple posts down on my page). The only worry that I have is that it might make you look bad, people who don’t read your blog wont know that it was already a torn up bible, and think that you have no respect. It may turn people away from your booth with the thought that you tore up a bible. Or if it was on your door, it may give people the wrong first impression. You may forever be explaining yourself. I know you wanted an honest answer so that the best I can do. I did ask my pastor what his thoughts were and he is going to text me back soon. ;-) It doesn’t make me think ill of you! I think it’s fine, but yes, some people will get upset. I made a book purse out of an old regular book (not a Bible) that I found at a thrift store. Most people loved it, but a few book lovers were horrified. I personally think you saved the Bible from being thrown away. I LOVE IT! But I got to tell you, a lot of people will not appreciate it. DO you not want it in your own home? Your wreaths are beautiful! I do see the issue here, but personally I feel you saved the book. I want it…I will buy it. I think it’s gorgeous…reminds me of this lady..SIMPLY JOYS PAPERIE (on Etsy).Her wreaths are definitely inspirational and gorgeous! She doesn’t use bibles that I know of but I figure if you hadn’t saved this then it would have been a landfill which definitely would have been better than being recycled (SUPER SARCASM). It was so refreshing to read your post! Your heart is 100% in the right place. Most people wouldn’t think twice about making the wreath out of the worn Bible. But you did. It is wonderful to see people that still respect and fear God. As for my opinion–I say use the wreath in your home. Or, if you decide to sell it in your booth, maybe you could add a little note to your price tag that it was made from a Bible that was falling apart and that you wanted to save it and preserve it rather than just throwing it away. . . just my two cents. Whatever you decide to do — I’m sure it will be the right decision. I actually have this Bible. At least it looks the same from the cover. Mine is a family heirloom with our family genealogy written in it going back 100’s of years. The Bible is from the late 1800’s. Do you know Deuteronomy 6:4-9? Verse 9 says ‘write them on the door frames of your houses & your gates’ talking about the Scripture(the Bible). That verse might be nice framed in the center of your wreath. Also, centuries ago, the Jewish people actually posted the Scripture on the door posts because of this verse. I think the Orthodox Jews still do it today. They even made little boxes, put the Scripture in them & wore them on their wrist or strapped to the forehead to help them remember God’s Word. I couldn’t make a craft out of the Bible(or buy one) myself but I would frame special Scriptures from a Bible that’s falling apart if it wasn’t sentimental to me. I LOVE your Bible Wreath. I think it would make a lovely Christmas accent. 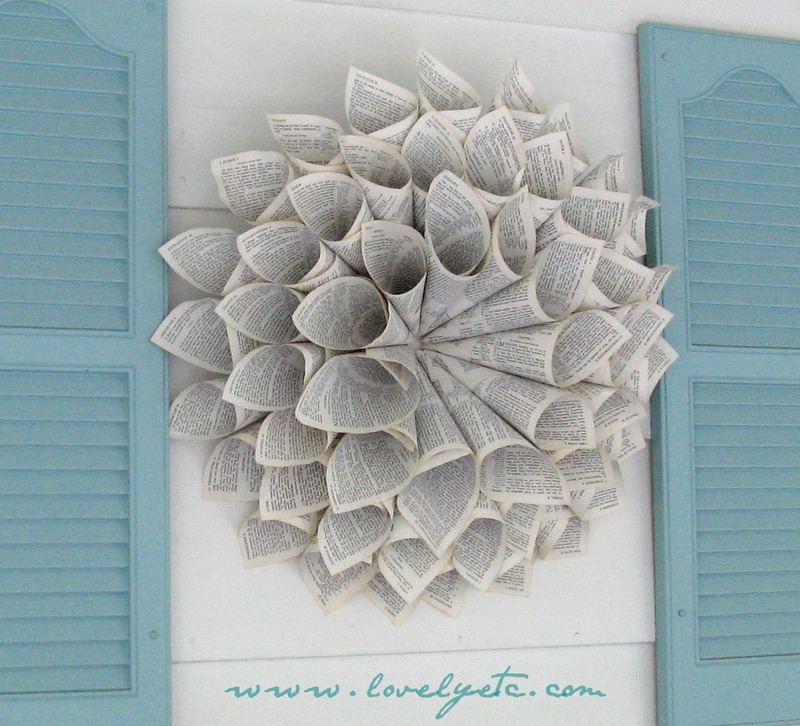 What a lovely way to save pages of scripture from the rubbish bin and incorporate the WORD into your home. I think it is a beautiful reminder. It would be in the garbage otherwise. I agree with the person who quoted the scripture about having the Bible all through your home. My step-mom stenciled scripture everywhere in our house and I loved it. People won’t always agree, but I think it’s lovely! I just used a Bible in my decor that was NOT falling apart but just a translation we never use. I lined the back of my newly built bookcase with it. Everyone loves it! I am wanting to do a wreath with the rest of the pages. I believe the Word should be posted all over the house and it makes people stop, look and ask (which opens up some Scripture talk!) than an un-used Bible on the shelf or table. LOVE you wreath! keep it up! I just wanted to thank everyone for giving their thoughts on this subject. I have replied to everyone with an email address attached to their profile. But for those who do not, I really appreciate you taking the time to give such thoughtful comments. I am not sure yet what I will do but all of the comments have been refreshingly honest and respectful. Thanks so much. I think it’s a lovely, meaningful, heartfelt way to use a special book that would likely otherwise be headed for the trash. It’s beautifully done, and I would be thrilled to have a special place for it in my home…as will other customers, I am certain. All customers do not have to agree…the beauty of art is in the eye and the heart of its beholder. I think your safe in recycling the book. Do you explain how you made this anywhere? I would love love love to make 3 to pin above my bed. This is absolutely GORGEOUS! I think the friend who told you that she thought it was terrible is rude. Geesh. That bible was going to be trashed….did she think that was the better option? I think it’s wonderful that you took something that was going to be THROWN AWAY and made a beautiful work of art from it. 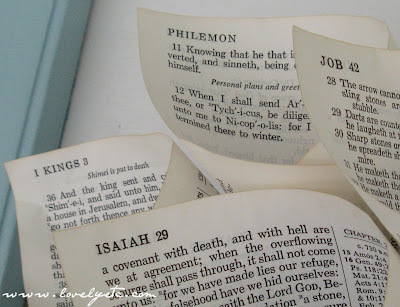 I am inspired to do this myself from an old bible we have of my husband’s parents that is falling apart (I can’t bring myself to put it in the trash!) Thanks for the inspiration. As for selling this in your booth, why don’t you consider putting a small tag or card on there explaining that you saved the bible from the trash? I would totally buy this in a store! 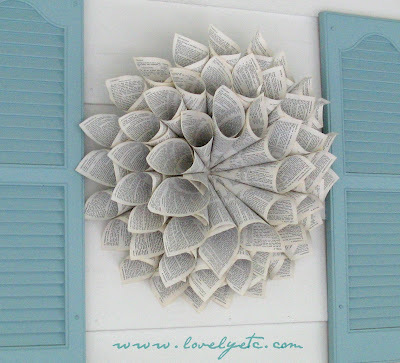 I love the this wreath and the many book projects I have been seeing lately. 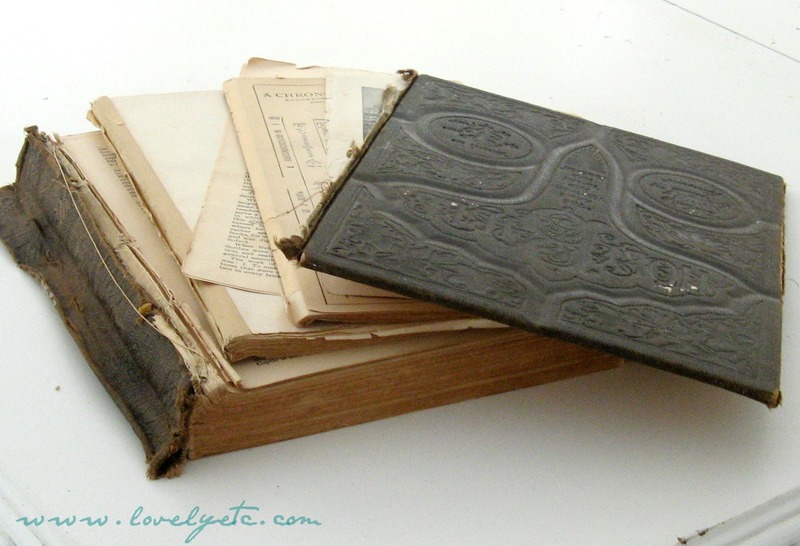 I wish I had discovered these before my husband threw away a set of encyclopedias. (we tried to give them away to every thrift store and no one would take them.) thanks for sharing your art. This wreath is just beautiful! Love the simplicity of it!! Well – which is worse – in a box in the garage, collecting dust on a shelf or displayed and starting conversation on the wall? I have a hard time throwing out leftover sheets of scripture I’ve printed from online for my kids to memorize – it’s just hard to throw it away – ya’ know? In fact – we have an inaccurate translation of the Bible that some door to door witnesses left with us and I’m having a hard time knowing what to do with it. A great deal of it is correct, but some of it has been mistranslated. I don’t want to pass it along but I don’t want to just throw it away either. I’m visiting from the Best of 2011 at Funky Junk! Hi Im Stacey and I came across this page while searching for something else. I dont think its terrible at all…the Bible is a sacred piece of parchment yes but its been copied 1000 times over into books that we read. Its just a book at the end of the day and whatever you learn from the Bible should be in your heart and head and in everyday life, not in a book. Oh and BTW I am a Ministers daughter and my father taught me that! So my advice, keep doing what you doing because to see the Bible in a place in your home that means something to you, rather that collecting dust is beautiful. Do you have instructions on how to make these anywhere? I adore this idea and I already found an amazing old bible at a thrift store. I think it is gorgeous and I feel since you made it for your home and not for sale, it is definitely not being disrespected. I am sure this will become a family heirloom and you will value it always. You were meant to find it and turn it into something beautiful. I also think it’s beautiful and, in a way, it can be more meaningful this way than it could when it was falling apart on a shelf. How many people would have ever seen it if you had left it there? But now, thanks to this project, who knows how many have seen it and been reminded of the Bible itself, the times they read it, learned from, the morals of their childhood? Isn’t that what the Bible is supposed to do? In this day and age where you can’t pray in public or schools or discuss religion unless it’s in a political sense I think this is lovely way to remind people of what’s really important and the values that matter. I think it is something God would do. He makes beautiful things out of the broken and the falling apart. He wants you to use the gifts He gave you to glorify Him. I think you did just that. Thanks for your comment. I love the perspective you offer about how there are those in other countries who truly treasure the Bible as the word of God. Many of us here say we treasure it, but we really just mean we keep it nice – and largely unread. Your wreaths sound great – I am definitely going to check them out. I love this. Would you please show in detail how you made it? Did you hot glue the pages? What did you post it to so that you could hanging it? I will be making one, but I would rather make it correctly the first time, instead of re-inventing the wheel. :) I think I will buy a new bible with the silver edging. I want to put a medallion in the middle with the scripture verse we used on my Mother’s headstone – God is Love. 1 John 4. This will be the decor over the guest bedroom head board. Thanks so much for this awesome idea! I love your idea of adding a favorite verse to the middle. I have had a few requests for a tutorial of this so I will try to get one posted in the next few weeks. i think it is totally great! i want to do the same thing in my booth in texas, but as we live in STRONGLY church-oriented community, my husband advised me not to. however, i think that posting the pic of the abused Bible is a great way to show the discontents that you REALLY did save it and are spreading Scripture in your own way. i’m gonna give it a try–if i never sell another thing, i’ll know the answer to my own situation-my community is not ready to embrace this way of reading the Bible. Carol, Thank for the comment. It really does seem silly to keep a broken, abused Bible around to be ‘sacred’ when it could still be out where people can see it, doing good. Good luck with selling your own Bible wreath – if nothing else maybe it will make some people really think about how they view the Bible. Sometimes a bit of controversy can be a really good thing. Growing up, I was taught it was wrong to write in your bible or fold the pages, etc. But then as a teenager, I heard a pastor say that he loved seeing old bibles that were falling apart and had writing in every margin. It shows that the bible was loved and studied over. It was a representation of the owner’s love for the Word. I understand both points of view, but I just love the wreath. If I were to enter your home and see that hanging on the wall, I would think that you were someone with a love for the bible. After all, you are using it to beautify the place that you love most in the world…home. Mel, When I was younger, I definitely used to write and highlight in my Bible like crazy. I remember one Bible I had that the cover literally broke in half. And thanks! I really love that wreath too!